^ "ESX Server Architecture". Vmware.com. Archived from the original on 7 November 2009. Retrieved 22 October 2009. ^ "Glossary" (PDF). Developer’s Guide to Building vApps and Virtual Appliances: VMware Studio 2.5. Palo Alto: VMware. 2011. p. 153. Retrieved 9 November 2011. ^ "Did you know VMware Elastic Sky X (ESX) was once called 'Scaleable Server'?". UP2V. 12 May 2014. Retrieved 9 May 2018. ^ "VMware ESXi was created by a French guy !!! 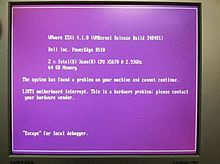 | ESX Virtualization". ESX Virtualization. 26 September 2009. Retrieved 9 May 2018. ^ "ESX Server Architecture". Vmware.com. Archived from the original on 29 September 2007. Retrieved 1 July 2009. ^ "ESX machine boots". Video.google.com.au. 12 June 2006. Retrieved 1 July 2009. ^ "VMKernel Scheduler". vmware.com. Retrieved 10 March 2016. ^ "VMware ESX Server 2: NUMA Support" (PDF). Palo Alto, California: VMware Inc. 2005. p. 7. Retrieved 29 March 2011. SRAT (system resource allocation table) – table that keeps track of memory allocated to a virtual machine. ^ a b c "ESX Server Open Source". Vmware.com. Retrieved 1 July 2009. ^ "ESX Hardware Compatibility List". Vmware.com. 10 December 2008. Retrieved 1 July 2009. ^ "ESXi vs. ESX: A comparison of features". Vmware, Inc. Retrieved 1 June 2009. 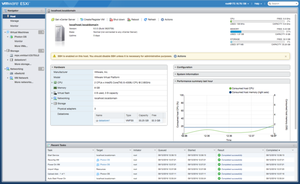 ^ "VMware ESX and ESXi 4.1 Comparison". Vmware.com. Retrieved 9 June 2011. ^ "What do ESX and ESXi stand for?". VM.Blog. 31 August 2011. Retrieved 21 June 2016. Apparently, the 'i' in ESXi stands for Integrated, probably coming from the fact that this version of ESX can be embedded in a small bit of flash memory on the server hardware. ^ Andreas Peetz. "ESXi embedded vs. ESXi installable FAQ". Retrieved 11 August 2014. ^ "Free VMware ESXi: Bare Metal Hypervisor with Live Migration". Vmware.com. Retrieved 1 July 2009. ^ "Conservancy Announces Funding for GPL Compliance Lawsuit". sfconservancy.org. 5 March 2015. Retrieved 27 August 2015. ^ a b "Configuration Maximums" (PDF). VMware, Inc. 22 April 2015. Retrieved 5 April 2018. ^ "Performance of VMware VMI" (PDF). VMware, Inc. 13 February 2008. Retrieved 22 January 2009.